Everyone worries about running out of money in retirement. Few people feel secure about government spending and Social Security. Even fewer retirees are confident about the future returns of the stock market. In the midst of this turmoil, especially after this past summer’s sharp drop, many investors wonder if they should put all of their investments into something safe and avoid the markets altogether. What people perceive as secure varies and includes bonds, cash, gold bullion or immediate annuities. Recent history has proven that safe investments generally don’t produce decent returns. For example, bonds get downgraded, and even entire countries default. Cash is currently paying close to zero. Gold bullion lost 69% of its value over a 21-year slide for a consistent annualized loss of 5.5% ending in 2001. Safe withdrawal rates in retirement are mathematical attempts to determine what percentage of your portfolio you can spend in a given year. That amount is increased by inflation each year. In other words, what is the maximum standard of living you can maintain for the rest of your life and not run out of money before you die? In financial planning, a good chance means at least an 80% likelihood of staying solvent. Any failure rate less than 20% is considered acceptable. If you aimed for a 100% success rate, your spending rate would approach zero. Financial systems are not well behaved statistically. They are often subject to events that are multiple standard deviations away from the norm. That’s why I always describe the markets as inherently volatile. In mathematical terms, market events are not Gaussian; they are subject to power laws. That is, rather than a predictable bell curve of results, they have lumpy tails or more wild returns than you would normally expect. Government pensions could fail. The markets could drop precipitously. The Treasury could default. Tax rates could double. We could experience hyperinflation. These unexpected occurrences, often called “black swan” events, mean it is nearly impossible to achieve a 100% success rate in retirement. Multiple studies have tried to compute the safe withdrawal rate at age 65. The original studies suggested 4% was overly safe and 5% was too much. Planners later argued these conclusions were either too aggressive or too conservative. The original allocation was 50% stocks and 50% bonds. Subsequent studies show a better success rate with 75% stocks and 25% bonds. Most studies rebalanced back to a constant asset allocation. But some research suggests that adjusting the asset allocation to gradually grow more conservative provides a higher success rate. Others set the safe withdrawal rate and then blindly increase it by inflation. In the real world, however, people adjust their spending depending on good or bad years in the markets. Our safe withdrawal rate assumes an age-appropriate asset allocation, starting at age 65 with about 75% stocks and 25% bonds. Normally such a portfolio would average 5.6% over inflation. But the stock market can have wild returns for a decade. We can only count on getting returns that average 3% over inflation, close to the average return of a bond portfolio. The glide path for our top-level asset allocation starts with 75% stocks, but by age 96 the portfolio is completely in bonds. We also recommend making annual adjustments to your safe spending rate rather than blindly increasing your withdrawal rate by inflation regardless of what happened the previous year in the markets. Given this methodology and investments strategy, our safe withdrawal rate at age 65 is 4.36%. Thus for a $1 million portfolio, the annual safe withdrawal rate is $43,600. We use projections for average portfolio returns to last until age 100 to ensure an 80% success rate at the average life expectancy. Then we run a Monte Carlo simulation to ensure that 80% success rate. Sometimes clients ask us not to use age 100 so they can safely spend more money. We do not oblige. A 50-50 chance of having money through age 100 provides only an 80% success rate through the end of your life. Our analysis gives you the freedom to spend as much money as you safely can in retirement. But our safe withdrawal rate is only appropriate if your asset allocation strategy was also designed to maximize success. It should not be used with other investment strategies. For example, if you put most of your money in more stable fixed-income investments, the odds of averaging 3% over inflation are much less likely. With a bond portfolio, you only have an 80% chance of keeping up with inflation. And simply keeping up with inflation means a much lower withdrawal rate. 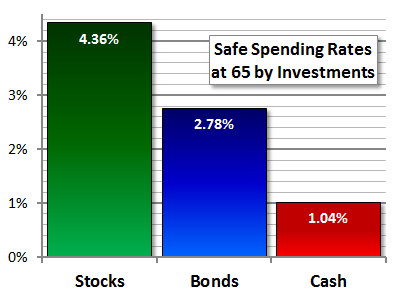 A portfolio with an 80% chance of keeping up with inflation has a safe withdrawal rate at age 65 of only 2.78%. At age 65 you have 36 years through your 100th year. With this withdrawal rate you have a 50-50 chance of making it through age 100 and an 80% chance of not running out of money before you die. Keeping all of your investments in stable bonds might look like an attractive option during volatile markets. But spending only 2.78% of your portfolio at age 65 certainly is not. With 75% of your investments in equities, you can spend $43,600 of a $1 million portfolio. If you keep everything in bonds, you can spend $27,800, less than 64% of your budget otherwise. A bond portfolio at least keeps up with inflation. Other investments will not. Cash, gold bullion and real estate with no income may not. Keeping your money in cash is probably one of the riskiest strategies. The biggest concern in retirement normally is inflation. And the biggest danger is a black swan event for inflation. In recent years inflation has averaged 5%, partly because of the double-digit inflation of the 1970s. Official inflation numbers were recently skewed downward because in 1997 the government changed the way it calculates inflation. Assuming an average 5% inflation, safe withdrawal rates for a portfolio invested in cash-like investments is only 1.04% at age 65. So instead of being able to spend $43,600 of a $1 million portfolio, you would only be able to spend $10,400 at age 65. Spending less than a quarter of your lifestyle is not worth running to cash every time the markets drop. In fact, given market volatility, turning to cash when the markets drop will likely lock in losses at the lowest point. The markets are inherently volatile. What you must give up in your lifestyle to avoid market volatility is not worth it for most retirees. Make sure your portfolio asset allocation is set appropriately and well diversified across all six asset categories. And then moderate your spending each year in accordance with the safe percentages for your age. Having an appropriate asset allocation matters for what you can safely spend in retirement. Subscribe to Marotta On Money and receive free access to the presentation: The Ten Best ETFs of 2012.